Hello intrepid internet explorer! 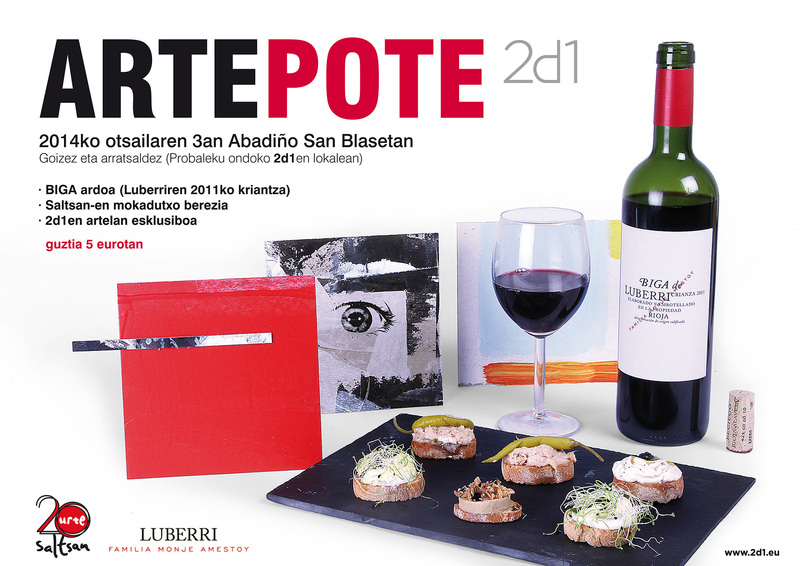 We would like to invite you to a special exhibition that we’ve christened “Arte Pote”. It will take place on 3rd February during the San Blas festivals in Abadiño (Bizkaia, Basque Country). We have been creating under the name of 2d1 for two and a half years now. We’ve put on 6 exhibitions as well as working on all manner of shows and art spectacles. It’s time for a change of direction now, and what better way to embark on new journeys and paths than with a raising of the glass and a toast to all we’ve done so far, surrounded by art, wine and friends. > an exclusive piece of artwork by 2d1. So don’t hesitate or the opportunity will have passed! Head to San Blas to experience the most authentic agricultural Basque fair around, and head home with your bellies full and your cockles warmed. You’ll find us at our little studio next to the ‘probaleku’ in the heart of Abadiño. PS: 2d1 cannot be held responsible for outward shows of celebratory bliss that may will probably arise.